This type of system is a great starting point to understand the typical system. 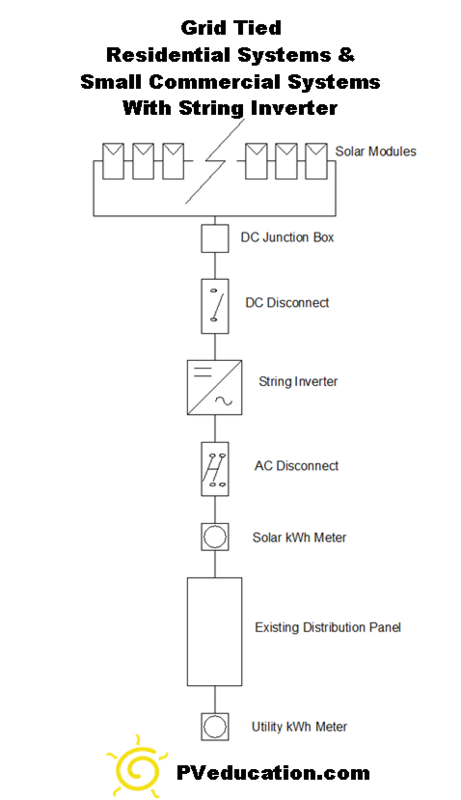 The solar modules are wired in series and parallel to form a solar array at a voltage and current level that matches the inverters input. The wiring behind the solar modules is a single conductor wire that is transitioned at a junction box to wire that is inside of conduit. Conduit is used to protect the wiring and runs to a DC disconnect. The DC disconnect will allow the DC input to be turned off so the inverter can be serviced safely. The inverter will convert the DC input into an AC output that matches the utility grid it is connected. The inverter is the true brains of the system and is responsible for the systems safe interconnection to the utility and its safe operation. The inverter is than wired to an AC disconnect so the AC power can be isolated from the inverter turning the entire system off. Most systems will have a solar kWh, kilo-watt hour, meter to accurately record the output of the system. From there is the system is wired into the utility grid. A system like this works by offsetting the amount of power a home or business consumes from the utility company. Essentially the utility meter will spin backwards during the day earning you a credit that is used in the evening. If the utility power fails, this system is designed to turn off and not produce power. There are new inverters in the market place that include secure power supplies to supply some limited backup power to an outlet without the need for batteries.